Shaking Up Earthquake Safety: As we all already know, California is “Earthquake Country”. With the increased earthquake activity in Italy, I think that earthquake safety is a timely topic. 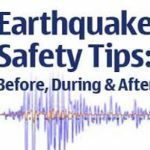 The information below provides some practical safety tips to help us all prepare for the inevitable. Flashlight and shoes next to the bed. A supply of fresh water and non-perishable food. Lots of spoons so we can eat all of the ice cream before it melts! Earthquake Country Alliance has some good information. Click Here to see the FEMA earthquake preparedness guidelines. At Bregman Properties, whether you are buying OR selling, we will do whatever is necessary to make your real estate transaction a success!